What Is the Worst Case Channel to Channel Skew? Which Saleae Products Can Decode 4-Bit Parallel LCD Communications? How Can I Compare Two Clock Signals for Synchronization and Drift? How Can I Compare a I2S Audio Recording to an Existing Audio File? Can I Create or Edit .logicdata Files? Can a Capture Be Cropped or Trimmed? Does the Saleae Logic Support the Raspberry Pi? How Can I Record Power Consumption? How Long Does It Take to Save a File? What Is the Maximum Bandwidth of Logic? How Long Can I Record Data? Can I Export Protocol Results Between Timing Markers? Can I Generate an Analog Graph from Digital Data? Are the Inputs Synchronously Sampled or Sweep Sampled? Can These Products Replace an Oscilloscope? Can I Use Multiple Logics on a Single PC? Are .logicdata files Backward and Forward Compatible? Is It Possible to Trigger On a Protocol Frame or Pattern of Bytes? Are the Ground Pins Required for Each Input Used? How Can I Start and End the Capture Manually Instead of Specifying the Length of the Capture? Can Saleae Products Output Data? How Can I Analyze the USB Power Delivery Communication Protocol? What Sample Rate Is Required for a Given Signal? Can I Share Data Captures with Others? Which Logic Analyzer Should I Get? Can Logic Operate with a Full-Speed USB Isolator? Which Saleae Devices Support Analog Recording? Is It Possible to Adjust the Logic Thresholds for the Digital Inputs? Why Does Channel 0 Use a Black Wire? Are the Input Channels Isolated from Each Other? Which Export Options Are Available Through the Socket API? Are There Feature Differences in the Software when Different Logic Analyzers Are Used? What Higher-Level Protocol Analysis Features Are Available? How Can I Compare Signals from Different Captures? Do the Saleae Logic Analyzers Support Trigger Out? Why is the Length of my Capture Incorrect? Can I Change the Voltage Range of the Analog Inputs? How Does the ASCII Radix Display Characters? Do I Have a USB 3.0 Port? What Is the Best Way to Compare Similar Sequences of Protocol Data? Which Version of the Software Should I Use? Can Custom Analyzers Process Analog Channels? How Can I Take Long Captures That Cannot Fit into Memory? 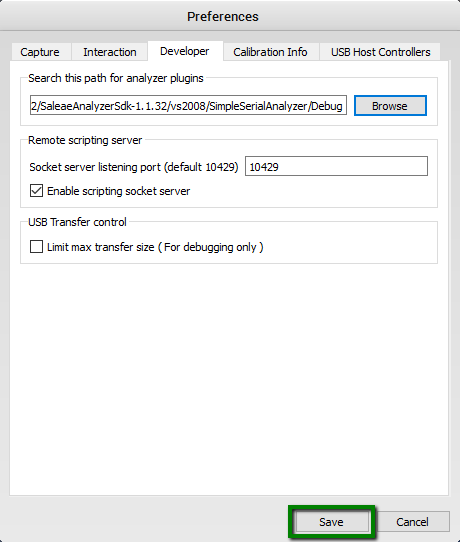 What Options Are There to Export Multiple Protocol Analyzer Results into the Same File? Do the Saleae Devices Support AC Coupling? How Many Protocol Analyzers Can Be Used at Once? Is It Possible to Run the Saleae Software on a PC without SSE2 Instructions? Do I Need to Calibrate Saleae Logic? Is It Possible to Import Data into the Logic Software? How Do I Convert Exported CSV Analog Data in Voltages? Why Does Logic Get Warm? Is There a Newer Version of the Software Available? Is There a Way to Change the Window Resolution? How Can I Extract Recorded Data Using the Socket API? Does the Software Support Windows 10 Tablets or Windows RT Tablets? 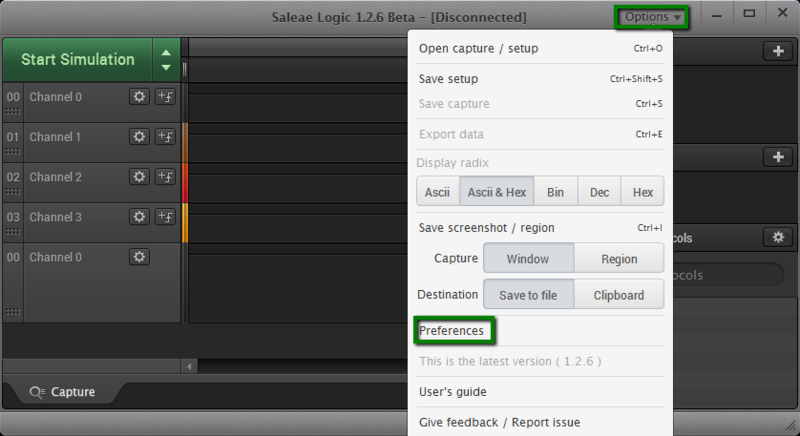 Does the Saleae Software Support the Original Logic and Logic 16? What Sample Rate Settings Are Available? Can I Sample at a Slower Rate? How Do I Differentiate Data in the Export File when Duplicate Analyzers Are Used? 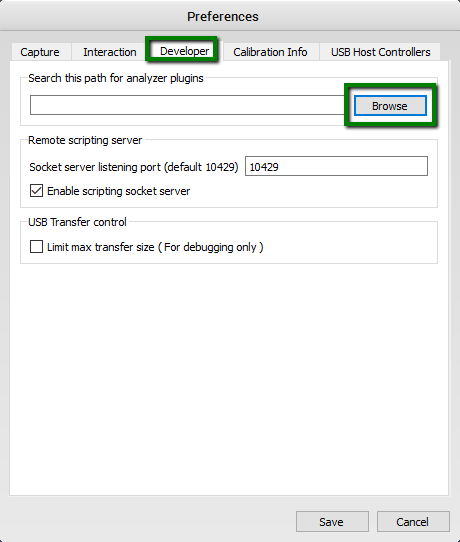 These instructions show how to set up the Saleae software to load custom protocol analyzers. First, open the Options menu and select Preferences. Navigate to the Developer tab and click Browse in the "Search this path..." section. Browse to the location where the .dll, .so, or .dylib analyzer library is stored. Close the software. 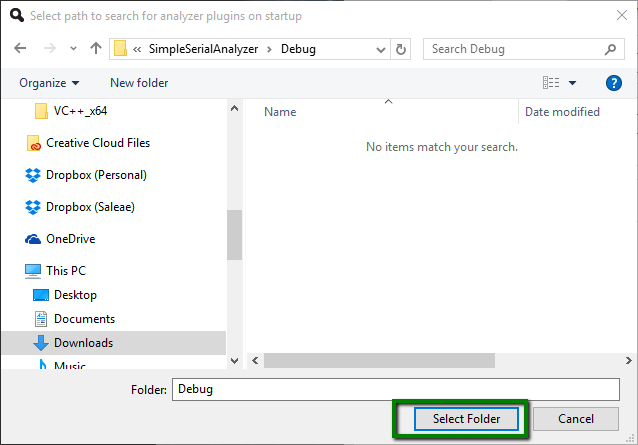 Custom analyzers won't be loaded until the software is restarted. Can't Find the Options Button? Please refer to the article below. You may be running an older version of our software.